Welcome to our comparison post of 5 beautiful faux stone electric fireplaces, home decor focal points. We decided to take a look at stone look electric fireplaces for two reasons. Firstly, they are designed to be room focal points. They come in a wide variety of looks from rustic stone electric fireplaces, electric fireplace stacked stone, which are very traditional, to electric fireplaces with multicolor stone façades. There are different looks available to enhance, or be the center point, of any room or home decor. 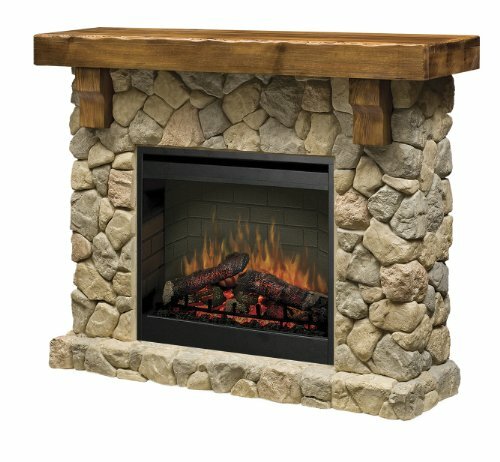 Secondly, there was almost universal agreement among buyers that these faux stone electric fireplaces looked incredibly real. In fact, we ran across numerous comments that said people had to get right up to it and touch it or not it with their knuckles to be sure it was not really stone. We selected five stone electric fireplaces with mantels to take a close look at. We hope you enjoy our comparison in our selection. Down at the end of the post are even more electric fireplaces with the stone look see get a sense of different styles available. We have done complete reviews on the first three stone electric fireplaces listed, just click the link to view them. The last two electric fireplaces are more styles by Southern Enterprises, whose fireplaces we have often reviewed. 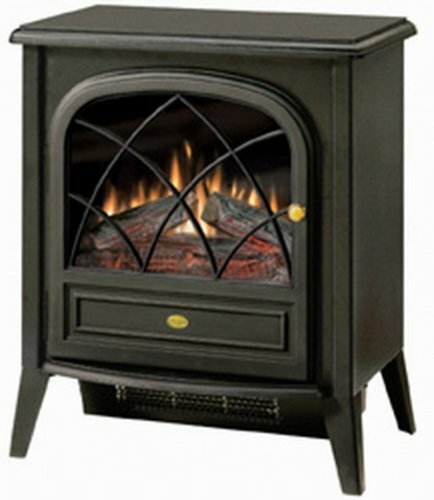 We always are comfortable recommending Southern Enterprise, SEI, electric fireplace furniture. We really like this beautiful, classic, decorative fireplace which is manufactured by Dimplex Inc. They are one of the largest companies and have superb electric fireplace technology. Before you ask, yes the ‘stones’ are very realistic looking. We really like the firebox which is quite nice. If you like the classic look, and it fits your personal style and decor – you can’t go wrong. Of those that provided a review for the Dimplex SMP 904 Fieldstone fireplace, 81% awarded the product a 5 out of 5 star rating and a further 10% awarded it 4 out of 5 stars. This is outstanding buyer satisfaction. The combined total is an impressive 91%. This fireplace was also featured on HGTV, it’s that good. This is a well built fireplace with a traditional rustic look that will be a talking point in your home or office. It is a lot sturdier than other fireplaces and justifies the higher price tag. The flame effects are good and the heater efficient. We would strongly recommend the purchase of this fireplace. We really like this decorative fireplace which is manufactured by Southern Enterprise Inc; a large furniture manufacturer. It is very stylish and there is great attention to detail on the cabinet. We really like the firebox which is quite nice and, in fact, has become a standard and is used in a number of their models. If you like the fashionable look, this may be the one for you. Of the entire customer reviews submitted, 84% of the customers felt that the fireplace warranted a 5 out of 5 star rating. A further 12% gave the unit a 4 out of 5 star rating which is a combined total of 96% and very impressive. It is felt that this overall rating is well deserved. This is incredible customer satisfaction – some of the best we’ve seen. If you are looking for a classic looking fireplace, which even has age distressing features such as imperfection marks and worm holes, then this unit is a good choice. The slate style and arched patterns is very effective. The Elkmont Electric Fireplace is highly recommended. This fireplace which is one of the very few stone electric fireplaces that is a convertible corner electric fireplace. The ‘convertible’ refers to the fact there are 2 placement options: flush in a corner or flat against a wall. 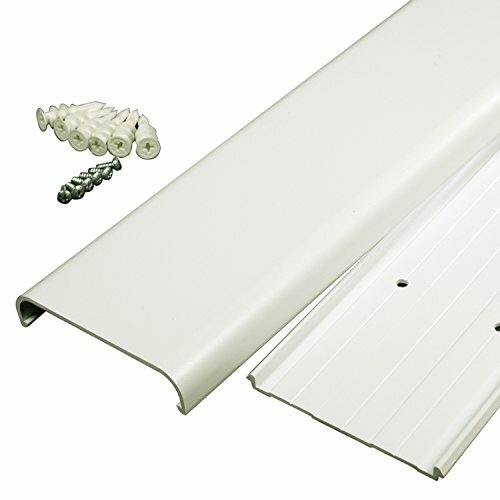 The corner fit is achieved by a triangular flap in the back that can be raised for corner placement, or left down for flush against the wall placement. It comes in two finishes, the darker Espresso or the lighter Mission Oak. 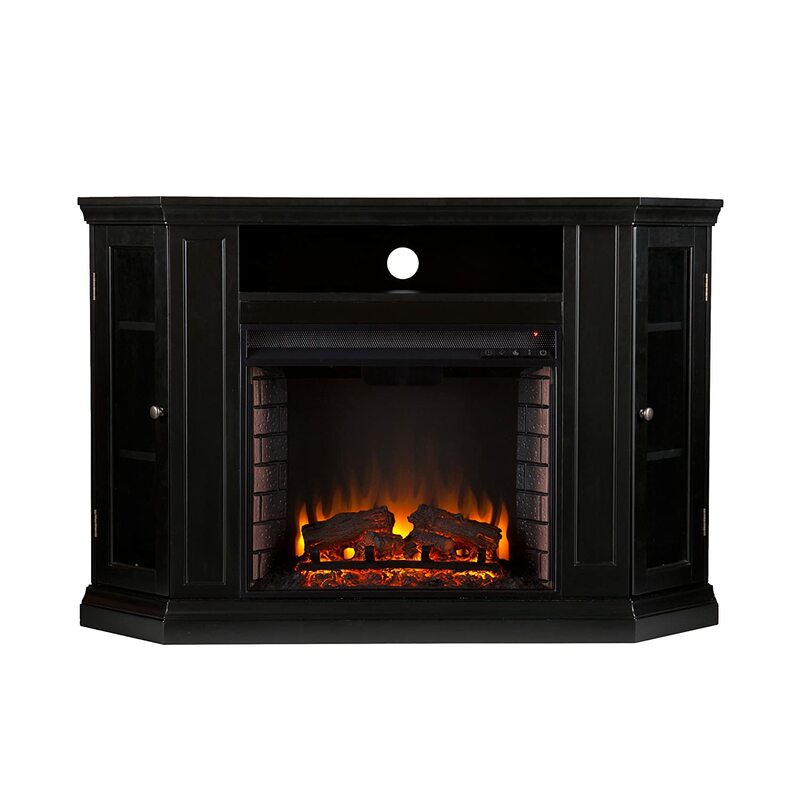 It is manufactured by Southern Enterprise Inc; a large furniture manufacturer.There were quite a few reviews from customers for the Calvert Carved Electric Fireplace and 79% of customers gave the product a 5 out of 5 star rating. This indicates exceptional customer satisfaction. A further 13% awarded the product a 4 out of 5 star rating meaning that a very healthy combined score of 92% was recorded. This is a stylish fireplace that has a lot of good features. The style is traditional but it has a modern feel about it. The realistic 3D flame effects provide a very good ambience. 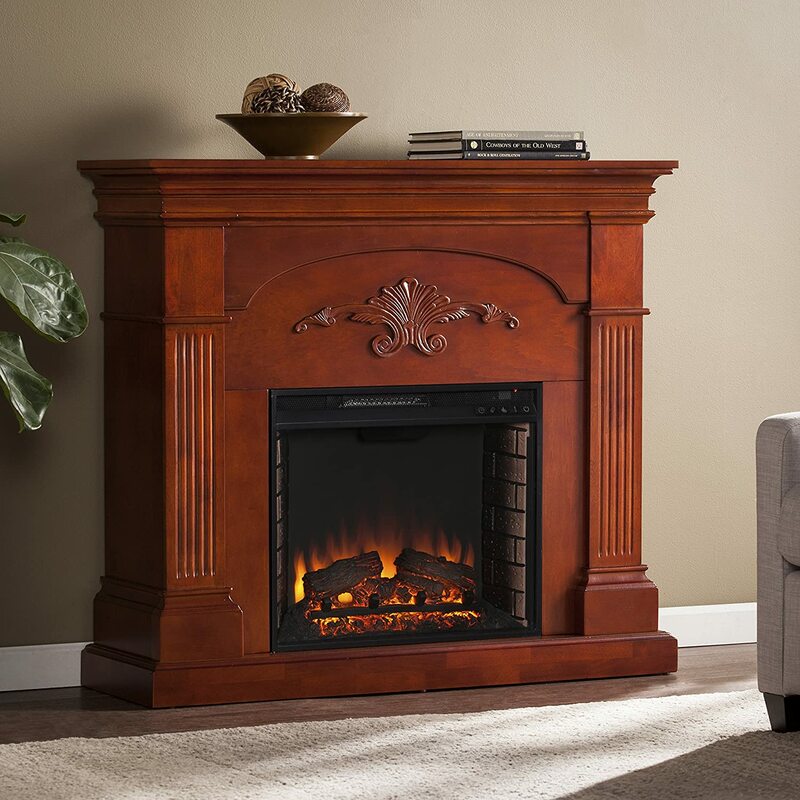 Overall the Calvert Carved Electric Fireplace is a recommended purchase. Other than stylistic differences, a major distinguishing characteristic of this fireplace is that it has quartz infrared heat. It heats larger rooms quicker and more efficiently; warms an area up to 1,000 square feet. If you are not familiar with infrared heat, click on our article electric fireplace infrared heat basics. 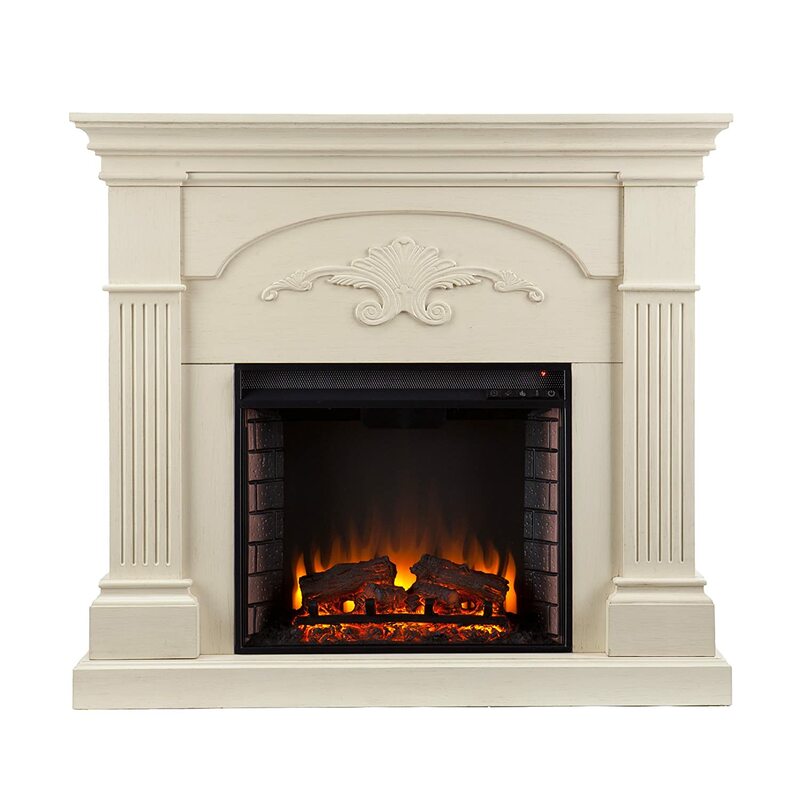 It is a white electric fireplace with faux stone in a traditional style with a coastal touch. the stones are authentically textured with a simulated stacked stone surround. This is another entry by Southern Enterprises who earned their chops primarily as a furniture maker. That’s why their style and quality build is so good. The flame effects feature 5-Way adjust-ability, flame, heat, lighting, log. It has realistic flames and faux brick interior which gives the fireplace an appearance of more depth. It includes the log set and ember bed; optional down light and a flickering log effect with 5 light settings. This is a wide screen version of the stone electric fireplace. It has a traditional look and the wood trim is a Whiskey Maple. The stacked, simulated stone adds a rustic appearance while still staying classy. The fire is lit by energy efficient LED bulbs, giving you a cost effective way to enjoy a fire without having to chop wood or clean the chimney. The user friendly remote allows you to access up to 4 adjusts to your fireplace, so you continue to enjoy the fireplace, even while sitting on your couch. The flames and logs each have 5-level adjustments with lifelike multi-color flames and burning logs with embers. The glass is always cool to the touch and the Fireplace has automatic shutoff for your family’s safety. Plus, if you want the flame without the heat, simply turn off the heat and enjoy the flames. There are 3 accessories you may want to consider, the first for added functionality, the second for added aesthetics and pleasure. The third recommendation, cord covers, are essential for wall mounted fireplaces. Otherwise you may see a dangling wire in the middle of your wall. Welcome to our comprehensive Dimplex Stone-Look Electric Fireplace Mantel Review, #SMP-904-ST. 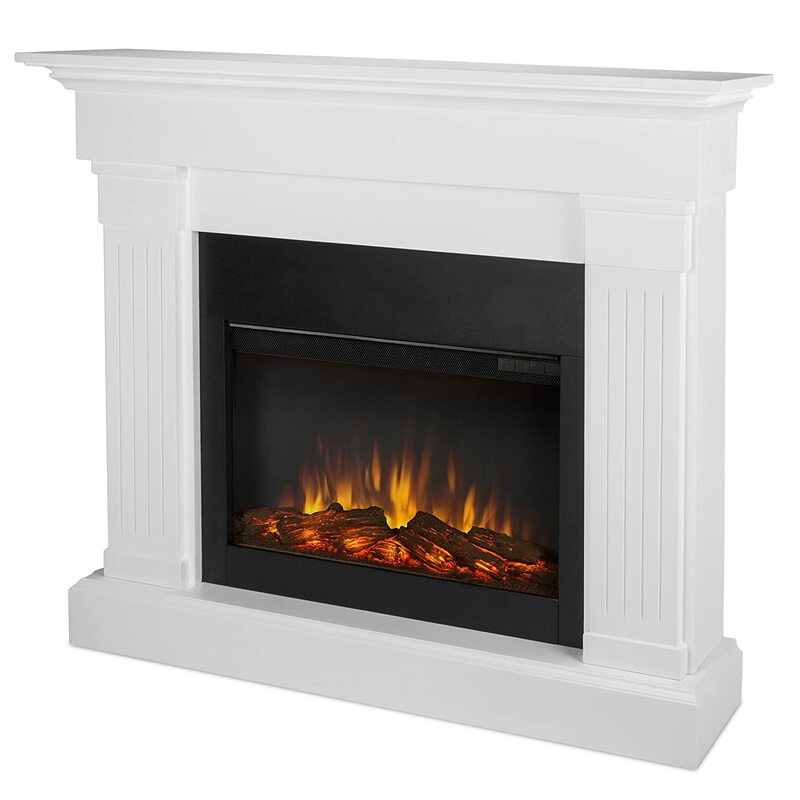 Spoiler Alert: We really like this beautiful, classic, decorative fireplace which is manufactured by Dimplex Inc. They are one of the largest companies and have superb electric fireplace technology. Before you ask, yes the ‘stones’ are very realistic looking. We really like the firebox which is quite nice. If you like the classic look, and it fits your personal style and decor – you can’t go wrong. Our goal is to have you to understand the full range of features and benefits that this fireplace can offer you, by offering a comprehensive and honest review. We have provided pros and cons of this unit which are actually summaries of reviews left by real customers. Please read the entire review so that you can make an informed purchase decision. 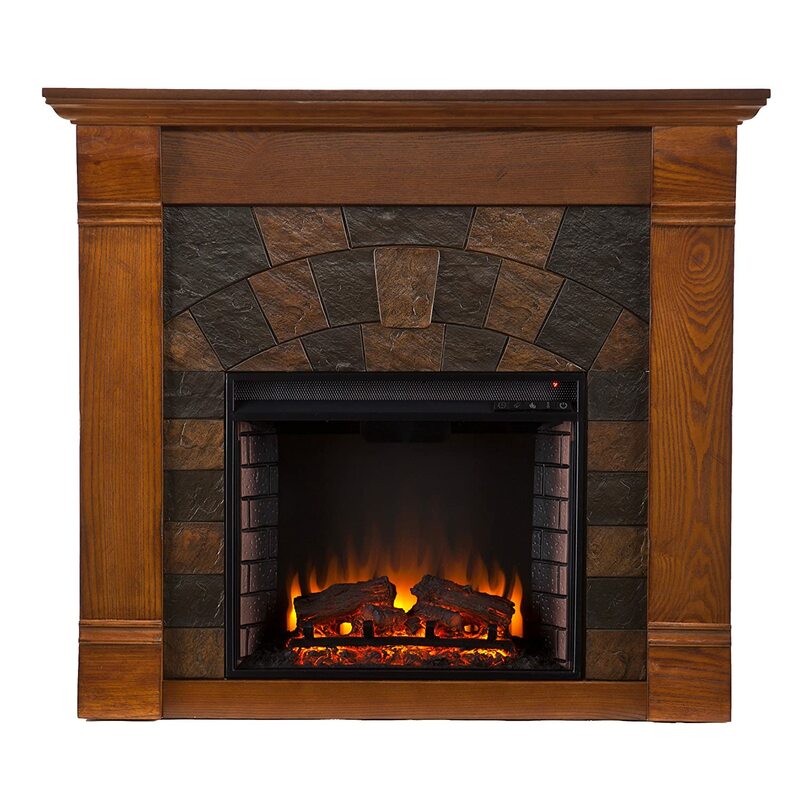 The Dimplex SMP 904 ST Fieldstone has a real rustic look and can be considered a traditional fireplace. The appearance is natural stone and it has a hand hewn pine mantel. The patented Dimplex flame technology provides a realistic flame effect that will provide great ambience in any room. Assembly is very easy. This fireplace has the patented 3D flame effect system from Dimplex. Patented LED inner glow logs and pulsating ember technology allow the logs and embers to glow in concert creating an unmatched realistic fireplace experience. There is an interior light which adds to the affect and the brightness can be increased or decreased. The flame speed is also adjustable. Dimplex fireplace logs are hand crafted and molded from real wood logs, offering an incredibly realistic log set. There are three bulbs under the logs that generate the flames and embers and two bulbs that provide illumination for the log exterior. These bulbs have a 60 Watt rating. The front glass will always be cool to the touch as there is no heat generated by the flame effects. The flame effects can be operated very economically without the heater being switched on. There is a 4915 BTU (manufacturers rating)**, fan forced heater which has an output of around 1500 Watts. The heat is thermostatically controlled. The heater in this fireplace has been designed to heat a 400 square feet room comfortably. The fireplace uses a standard 120 Volt power outlet for all of its functions. There are no pollutants, emissions or fumes from this fireplace as it uses an electric heater. The unit is energy efficient and will only cost around 8 cents per hour to run with the heating switched on and just 3 cents per hour if you only use the flame effects. There is a safety device with the heater which will prevent overheating. The heater on this unit got better comments and reviews than most. However, at Cozy by the Fire, we believe it is very important that everyone purchasing an electric fireplace heater be aware of the limitations of these units. Quite simply they will not heat your whole house. This is not a downfall of any particular fireplace heater. The limitation is a function of how much power and electricity can be pulled through a standard household circuit and outlet safely. It is true for almost all electric fireplace heater components. 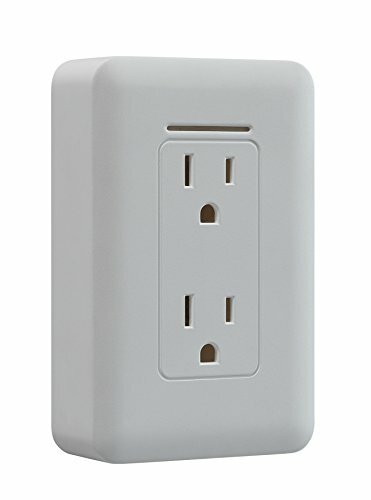 ** The Wattage rating in the table shown in Amazon’s product description is incorrect. There are a set of manual controls for the Dimplex SMP 904 ST Fieldstone which are located beneath the firebox behind the access flap. This is not really convenient, and the remote is only on/off. The limitations of the remote mean ‘on the fly’ changes to flame effects and heat have to be done at the fireplace. Once you have your preferences set the remote comes into play. There are flame action and light dimmer controls for adjusting flame speed and interior brightness of the firebox. The heater can be switched on or off using the next control and finally there is a thermostat control which can be turned clockwise to increase heat and counter clockwise to reduce it. 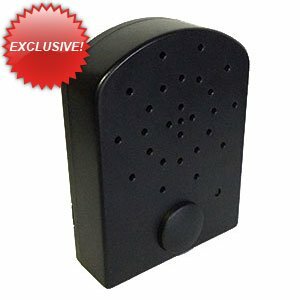 The supplied remote control enables the turning on or off of the fireplace. This fireplace unit is 55-5/8 inches wide by 42-11/16 inches high by 14 inches deep. The unit weighs around 191 pounds (shipping weight 220 lbs).. The firebox is 26 inches wide. The fireplace is supplied with a 6 feet long power cord, a remote control and a user manual which contains assembly instructions. There were quite a few comments from customers who were impressed with the quality of the fireplace. One said that the unit was “very well constructed” and it was also described as an “excellent product”. Many stated how beautiful the fireplace looked and one purchaser described it as looking exactly like the photograph. A few people said how real the stone and mantel looked and another felt that it had a real “country look”. Although the Dimplex SMP 904 ST Fieldstone fireplace is somewhat more expensive than other units we have reviewed, there were quite a few comments about how worth the money the unit was. The quality of the fireplace was the main reason for this value for money. A lot of people felt that this fireplace was easy to assemble. One person said that it only took around 30 minutes to assemble it completely. Another said that it was the “easiest thing to put together”. The usefulness of the installation instructions was also commented on. This Dimplex fireplace scored well in the functionality of both the heater and flame effects. The flame effects of this fireplace were very well received by the majority of customers. Some people said that they enjoyed spending their time in front of the fireplace and watching the flickering flames and burning embers. One person said that “the flames look as close to real as possible”. Our major gripe with this fireplace is with the controls and remote. The industry standard is pretty much having a full function remote, not just an on/off. Couple that with the manual controls location and it makes adjustments a bit of a pain. We found one customer who was upset that the remote control supplied only had an on and off function. They felt that this should have had more features. Again this was a single complaint and could be a fairly minor issue. You decide. “The faux stone color was cream” – one comment was about the faux stone claiming that the color was cream looking. It was felt by this customer that this made the fireplace look cheap and less realistic. This single opinion should not put you off purchasing this fireplace as most were thrilled with the realism. “Hard to install and not sturdy” – just one customer felt that the unit was difficult to install and when it was installed it didn’t look and feel sturdy; yet a 60 year old commented on how they assembled the unit alone and felt it was straight forward. This is not considered to be a major issue. One customer felt that the quality of this fireplace was not as they expected. The mortar used to form the rock was delicate and was subject to cracking and flaking. Most of the owners commented that they felt the fireplace was a quality unit so this is not considered a major issue. Welcome to our comprehensive review of an electric fireplace with a craved mantel. the SEI Calvert FA9278E. Spoiler Alert: We really like this decorative fireplace which is manufactured by Southern Enterprise Inc; a large furniture manufacturer. 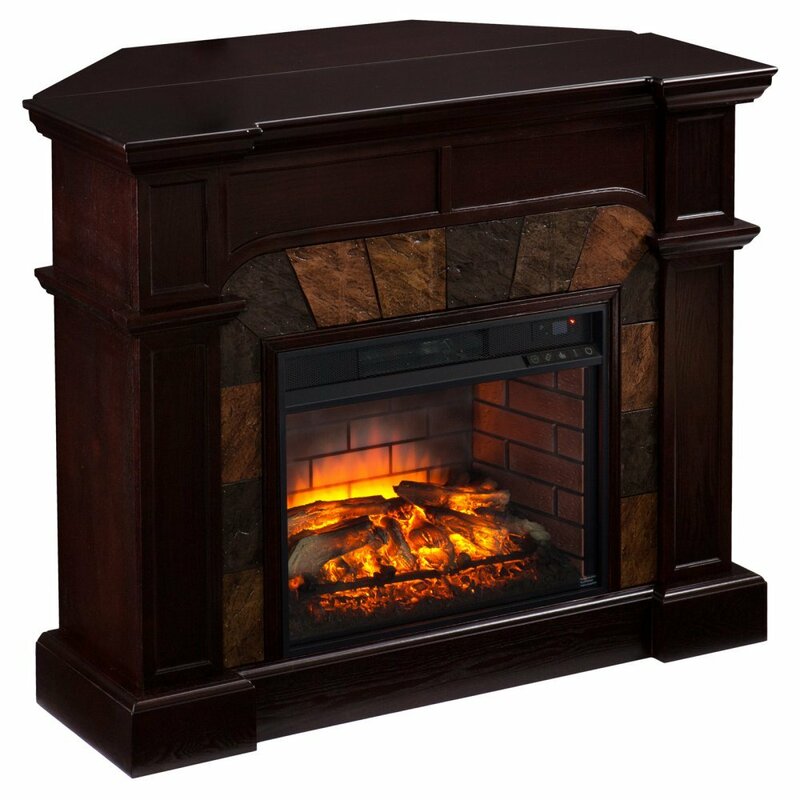 The Elkmont Electric Fireplace is a classic looking piece that will look good in any room. You can install it in your home or office easily and people that visit will comment positively about it. This fireplace has a timeless look that will not disappoint. It is very stylish and there is great attention to detail on the cabinet. If you like the look: ✔️ Check Today’s Discounted Price. We really like the firebox which is quite nice and, in fact, has become a standard and is used in a number of SEI models. If you like the fashionable look, this may be the one for you. We pride ourselves on providing honest, comprehensive reviews. This will provide you with all the important information and details that you need to make an informed buying decision. We will bring you all of the important features and benefits of owning this fireplace and also share pros and cons which are summaries from customer reviews left by real owners. This free standing electric fireplace heater accommodates a flat panel TV up to 42.5″ W overall with a base up to 40″ wide. The mantel can support up to 85 lbs. In addition to our comprehensive written electric fireplace reviews, we invite you to click through to our YouTube Channel for our video reviews. Each review is brief, about 2 minutes and to the point. This unit has a very realistic 3D flame effect and there are burning log embers and flickering flames. The intensity of the flickering flames and the burning embers can be adjusted with the infrared remote control to five levels. Energy efficient LED’s are used for the flame effects and these will last for a long time so there should be no need to replace them. Like most fireboxes used by Southen Enterprises, it is going for the realistic looking flame effect of a real fire. There are no fancy colors or psychedelic light shows. The flames operate independently of the heater. There is no need for the heater to be operational at the same time as the flame effects. The flickering flames and burning embers can be turned on without the heater which means that the ambience can be enjoyed even in the summertime. A good feature of the flame effects is that they will gradually fade out and turn off when the power is removed. The glass panel at the front of the unit will never be hot to the touch which is a great safety feature if you have young children. The fireplace uses a standard 120 volt standard electrical outlet. The fan assisted heater has a thermostat that can be used to control the heat output. This heater has been tested by the manufacturer and was able to heat a 400 square foot room in around twenty four minutes. It is not intended that this heater be the sole source of heat if you live in a cold climate. The temperature can be set in four intervals between 62° and 82°. Being an electric heater it is efficient and there are no fumes, emissions or pollutants. With the heater switched on it is estimated that the fireplace will cost approximately 10 cents to operate per hour. The heater can be programmed to switch on and off automatically through the use of the timer function. Safety is a prime concern and the unit includes a thermal overload protector. The heater will output a maximum of 1500 Watts and 5000 BTU’s. The limiting factor of heating capacity is the capability of standard household plugs and circuits; not the electric fireplace. Generating more heat requires more electricity than the plug and circuit can handle. The main controls are located on the top right hand side of the electric fireplace. Most users end up almost exclusively using the full function remote. You will be able to control this fireplace unit with the full function infrared remote control that is supplied (you will have to provide the 2 AAA batteries). With the remote you can turn the fireplace on and off and adjust the intensity of the flickering flames and the burning log embers. The heating timer can be set with the remote and the thermostat can also be adjusted in four different positions. 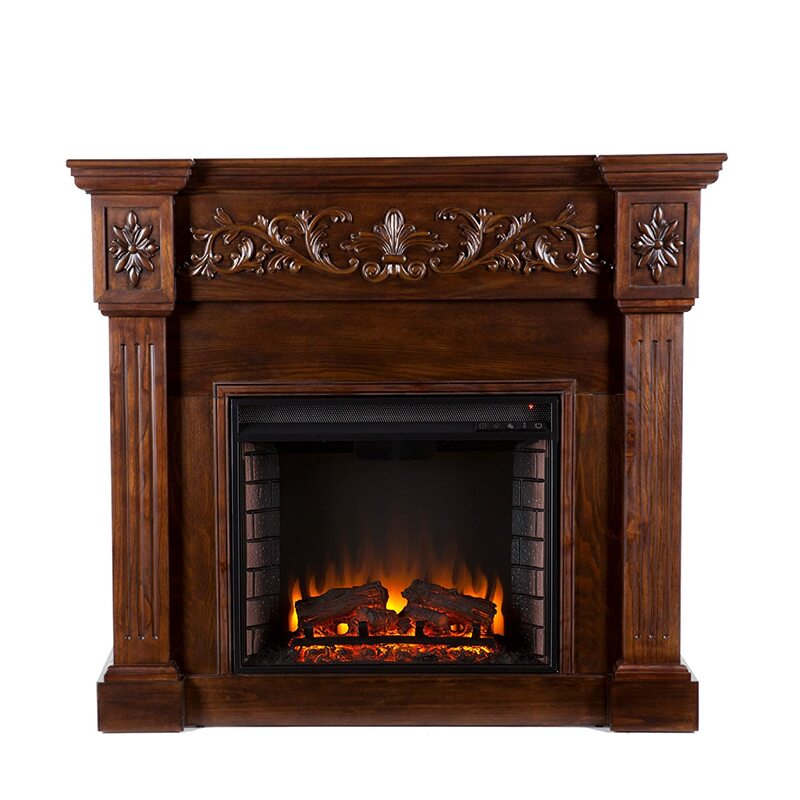 The Calvert Carved Electric fireplace is 40.25 inches high and has a width of 44.5 inches and a depth of 14.5 inches. This fireplace weighs just over 108 pounds. A six feet long power cord is supplied with a standard plug fitted. Also supplied is an installation manual and a remote control. The fireplace mantel has been designed to support a load of up to 85 pounds which means that a 43 inch flat screen TV can be accommodated. There were a number of customers who said that the fireplace was well made as well as a beautiful addition to their home. Some said that the unit was “very beautiful” and others described it as “gorgeous” and “elegant”. Many people liked the rich color of the espresso finish. As mentioned previously, the manufacturer Southern Enterprises always goes for a realistic flame effect. There were lots of comments about how real the flame effects looked with this fireplace. The flames were described as “very cozy” by some. The fact that the flames have five adjustment settings was also considered to be a very good feature. Some said that the flames transformed the rooms where the fireplace was situated. There were a lot of comments from buyers who stated that the fireplace was easy to assemble and put together. One customer said that they only needed one screwdriver to assemble the unit. One lady said that the fireplace was “easy to assemble even for a girl”. A lot said that it took between an hour and 1.5 hours to put together. “The heater kept the room warm” – the heater output received a number of positive comments. Most people were very happy with the heat output and said that their rooms were very cosy and heated up quickly. Remember to keep your expectations realistic. “This is a lot of fireplace for the money” – there were a few comments on the value for money that this fireplace offered. A few people said that it was worth the price and felt that the quality was worthy of a much higher price. This line of free standing electric fireplace mantels share the same firebox which is of good quality and the fireplaces look good. Most of the negative comments seem to refer to one of a kind problems for the most part, such as damage during shipping or a faulty part. To be fair and honest – we report them here. “The fireplace does not look the same as in the picture” – one customer was disappointed that the ivory colored fireplace did not match the photograph of it. They said that they were so unhappy that they would have to paint it. They had ordered the Ivory, White version which was discontinued as we wrote this review. This was a one off comment and nobody else stated that they were unhappy with either the ivory or espresso colors. “So many pieces to install” – the same customer that complained about the color also complained that there were too many pieces to put together. There were a lot of comments about how easy that the fireplace was to install so this is not seen as a problem that should put you off this unit. The degree of difficulty is about the same as assemblin an IKEA book shelf. The fire box is a complete unit and attaches to the frame with a few screws. (See image below). “The flame effect is noisy” – again an isolated comment. This customer claimed that the firebox was very noisy when the flame effects were switched on. This is seen as a one off incident and this customer was unlucky. A problem such as this will be covered by the warranty. “Product was damaged during shipping” – this can happen to anybody. The customer reported a couple of broken pieces and had to return the unit for new. Again this is not considered to be a manufacturing or quality problem. The problem was in shipping. 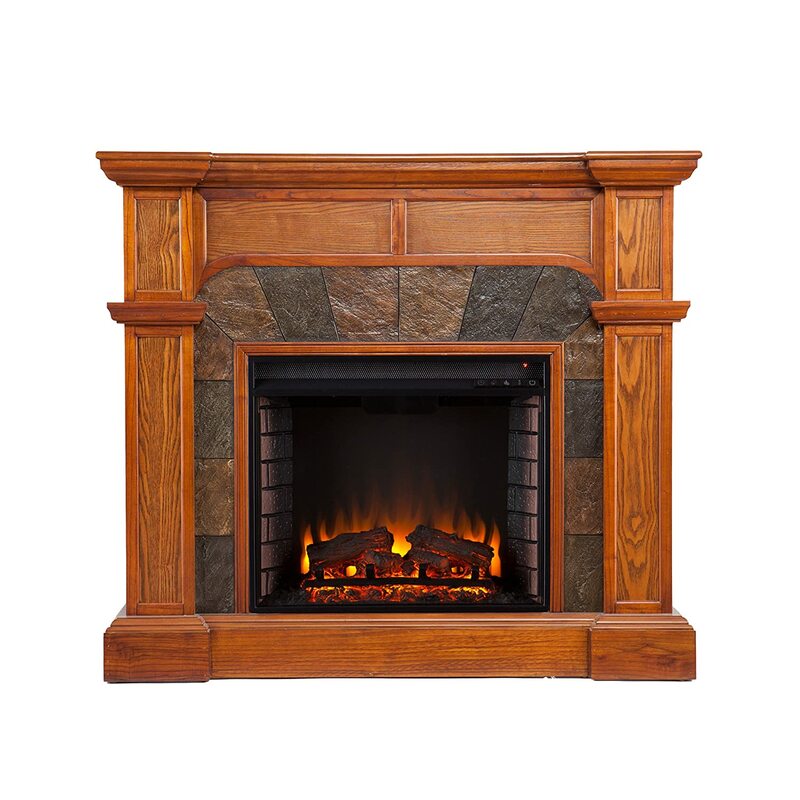 We have completed full, comprehensive reviews on these electric fireplace mantels that are similar in function. They have different styling cues. Click on the text link for the full review. Click on the image for discounted price comparisons. There were quite a few reviews from customers for the Calvert Carved Electric Fireplace and 79% of customers gave the product a 5 out of 5 star rating. This indicates exceptional customer satisfaction. A further 13% awarded the product a 4 out of 5 star rating meaning that a very healthy combined score of 92% was recorded. The heater is very efficient and silent and the bookshelves are a welcome addition. This fireplace is recommended by us, it really is pretty. Welcome to our comprehensive review of an electric fireplace with mantel. the SEI Elkmont FA9282E. Spoiler Alert: We really like this decorative fireplace which is manufactured by Southern Enterprise Inc; a large furniture manufacturer. It is very stylish and there is great attention to detail on the cabinet. We really like the firebox which is quite nice and, in fact, has become a standard and is used in a number of their models. If you like the fashionable look, this may be the one for you. It is a pleasure to bring you this Elkmont Electric Fireplace Salem Antique Oak review. We pride ourselves on providing honest, comprehensive reviews. This will provide you with all the important information and details that you need to make an informed buying decision. We will bring you all of the important features and benefits of owning this fireplace and also share pros and cons which are summaries from customer reviews left by real owners. 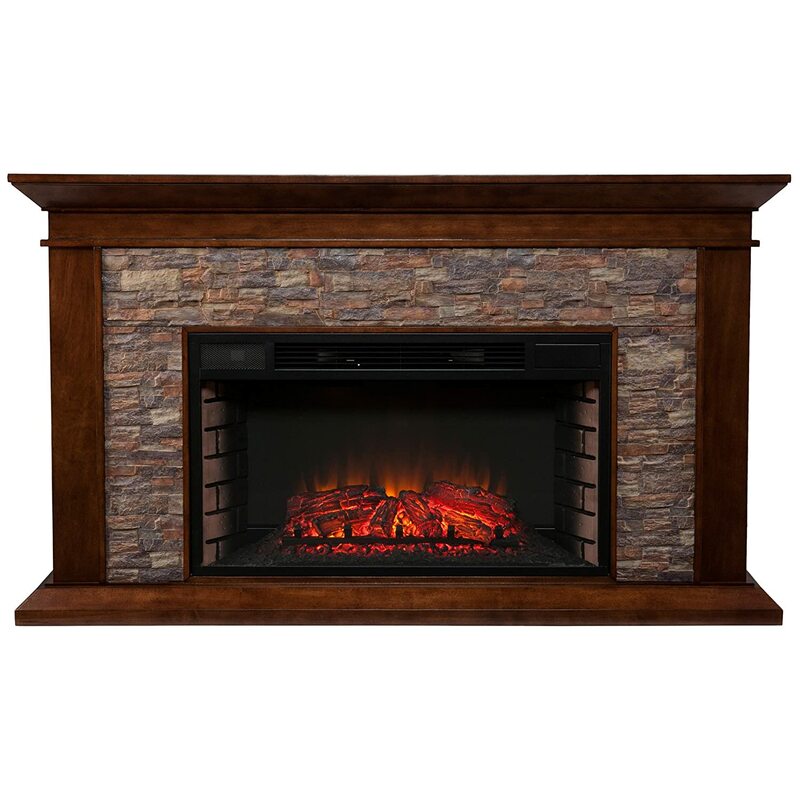 The Elkmont Electric Fireplace is a classic looking piece that will look good in any room. You can install it in your home or office easily and people that visit will comment positively about it. This fireplace has a timeless look that will not disappoint. This free standing electric fireplace heater accommodates a flat panel TV up to 43.5″ W overall with a base up to 40″ wide. The mantel can support up to 85 lbs. The firebox has a burning ember effect and a realistic flame effect which changes every couple of seconds. Both the burning embers and the flame effects can be adjusted using the remote control supplied. There is a down light effect. If you have young children or pets in your home then there is no need to be concerned for their safety as the glass at the front will not get hot. The burning embers and the flickering flames are powered by long life LED’s which are energy efficient and will not need replacement. After you remove the power the burning embers and flames will gradually fade out which is a nice touch. This fireplace features a thermostatically controlled heater which has four adjustment settings to heat your room. 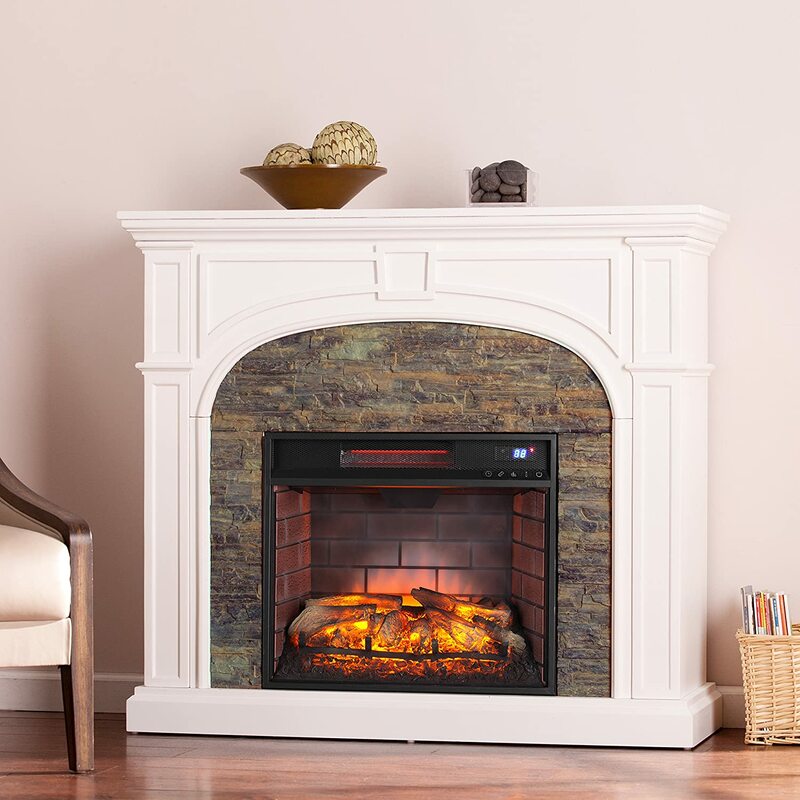 With the Elkmont Electric Fireplace all you need to do is to plug it in to a standard 120 volt outlet. The heater has been designed to produce supplemental heat and the fireplace has been tested to heat a 1500 cubic feet room in just 24 minutes. The fan assisted heater has a maximum output of 5000 BTU’s or 1500 Watts. The heater is energy efficient and will cost around 10 cents per hour to run. The thermostat can be set for 62-82 degrees at 4 degree intervals and the heater will shut off when the temperature is reached. There is also a safety thermal overload protector included. Being an electric heater there is no burning of fossil fuels and no pollutants or emissions. This fireplace is supplied with an infrared full function remote control that will enable you to fully control the fireplace. There is an on / off switch and a four position thermostat adjuster to increase or decrease the heat output. The burning embers and flame intensity can also be adjusted using the remote. Setting the timer is easy with the remote control. There is a child safety lock which is accessible from the remote. The overall dimensions of this fireplace are 45.5 inches in width by 14.5 inches in depth and 40 inches in height. The product weighs 102 pounds. The mantel of the fireplace will support up to 85 pounds or a 43.5 inch flat screen TV. There is a 6 feet power cord with the unit and a remote control and an installation manual. Many buyers have described the fireplace as “looking great” and it was also described as “beautiful”, “stylish”, “amazing” “fantastic” and “awesome”. One customer felt that the wood look and feel and the bevelled edges were really authentic and made the fireplace stand out from the rest. “This fireplace is a great conversation piece” No doubt about it this fireplace was perceived as a fashion forward room focal point. A number of people commented that the fireplace had attracted a lot of positive comments from visitors to their home or office. It was described as a good conversation piece by some. Several customers remarked on how realistic the burning embers and flickering flames. The flame effects were described as “very soothing” by some and one person said that the flames were as realistic as you can get without real fire. Another customer said that the simulated fire logs were the best they have ever seen. A lot of purchasers made comments on how easy it was to assemble the unit. Some said that it took just over an hour and others over two hours. The assembly instructions were very helpful said some customers. There were a few reviews that stated that the fireplace represented good value for money. It was felt that the quality of the fireplace was high and that more expensive units did not offer the same quality. We looked very carefully for negative reviews and ‘cons’ in terms of foreplace function and design and found none really. The negative comments and down grades from 4 or 5 stars appear to be one of a kind issues. “The power cord melted on the fireplace after two years” – one customer had a problem with this fireplace after two years. It was stated that the power cord melted. There could have been a number of reasons why this happened and it is viewed as an isolated incident which should not put you off of this unit. “The flames and fan stopped working” – again this was a single incident that happened to one customer. This occurred after two months and the flames would shut off for no reason. No other customers reported a problem like this. With the warranty the unit could have been fixed or replaced. “Hard to install and not sturdy” – just one customer felt that the unit was difficult to install and when it was installed it didn’t look and feel sturdy. A 60 year old commented on how they assembled the unit alone and felt it was straight forward. This is not considered to be a major issue. We have completed full, comprehensive reviews on these electric fireplace mantels that are similar in function. They have different styling cues. Click on the text link for the full review. Click on the image for today’s discounted price. In this Claremont Convertible Media Electric Fireplace review we will examine the full features and benefits that this unit has to offer. The “convertible” in the description means that it is designed to fit in a corner as well as flush against a wall if desired. It has a triangular flap in back that can be pulled up to fill the void when the fireplace is put catty-corner. You will also find a number of pros and cons that are summarized from real buyers and their comments reviews. Our aim is always to provide you with all the information that you need to make the right purchase decision. Yes, you can put a flat screen TV on the mantel top, up to 46″ wide overall and it can support up to 85 pounds in weight. This is a media console and fireplace combination which is very well designed. It will certainly be a fashion forward focal point in any room of your home. It will even add elegance to a home office. This fireplace will create a wonderful ambiance and make any room feel cozy. The fireplace has a brick design in the interior of the firebox for great, realistic looks. This provides the appearance of added depth also. The flame effects and glowing embers are very realistic and can be adjusted to create just the right mood. The flames are multi colored and the intensity and ambience created can be adjusted. There is no need to have the heater working to enjoy the flame effects of this fireplace. The heater function can be off while the flames are on. The flames and fire effects are all powered by energy efficient LED’s that provide crisp effects. These will never require replacement. The tempered glass that is used at the front of the fireplace is designed to never get hot, so any young children and pets will be safe if they touch it. The heater in this fireplace has been tested and will heat a 400 square foot room in around 24 minutes. There is a 4 position adjustable thermostat can be used to control the heat output from 750 watts to 1500 watts. A fan blows air out of the unit and the operation of the fan is almost silent. The heater uses a standard 120 volt electrical outlet for power and it is supplied with a 6 feet long electrical cord. The maximum output of the heater is 5000 BTU’s at 1500 watts with 12.5 amp consumption. The heater is very energy efficient and will cost pennies to operate. It only consumes the same amount of energy as a coffee maker. There is a safety thermal overload protector with this heater. Being an electric heater there are no smoke or fumes to be concerned about. This fireplace can be controlled using the manual buttons on the firebox, or through the use of the infrared remote control that is supplied with the unit. You will be able to use the controls to turn the fireplace on or off, control the timer, adjust the flame intensity and ambience, and use the four heater settings to control the room temperature. This fireplace / media unit has a unique collapsible panel which will allow you to place the unit against a flat wall or a corner (hence the ‘convertible’). The unit will accommodate a TV of up to 46 inches in width and it can support up to 85 pounds in weight. There were many customers that liked the look of the fireplace and some people commented that guests to their homes were very complimentary about it. The 4 different finishes provide the ability to really be able to match your homes decor. The unit has been described as “beautiful”, “gorgeous” and “lovely”. Many people said that the fireplace looked just as it was pictured. Quite a few buyers were very happy with the heat output of the fireplace. Many said that the heater made their rooms warm pretty quickly and the thermostat feature was popular with a number of customers. “It heats our room fine” was a very common comment. Remember any electric fireplace is best thought of as supplemental, not primary heat. The length of time for assembly varied. Yes, you do have to put it together, (see the cons). People stated to put together this fireplace varied, as you might expect, but the general consensus of opinion was that the fireplace was easy to assemble and the assembly instructions were very good. Some people said that the holes were all in the right place and drilled perfectly which made assembly much easier. There were numerous comments about the quality and sturdiness of the fireplace. Most people were very satisfied by the way that the unit was made. It is really interesting to note that our survey of criticisms of the fireplace were on the exact same topics as the praise for the fireplace. It seems you either like the looks, or not. It is easy to put together , or not. The heater was good, or not. There were a couple of customers who did not like the look of the flame effects and one person described them as ugly. The realism was questioned by one. This is not considered to be a major issue as these views are in the minority. One customer commented that the heater and fan had stopped working on the fireplace. This was considered as a one off experience that could happen to any fireplace heater. It is also an issue covered by the guaranty. One or two people that felt that the fireplace was delivered with too many pieces to assemble and that it took a lot of time. This is contrary to the majority view on assembly of the fireplace. We have lots of experience with IKEA book shelves and that is a realistic comparison for what to expect. There were a small number of customers who were unhappy with the overall quality of the fireplace. These people were certainly in the minority and there isn’t any compelling evidence to suggest that the fireplace is poorly made. This corner electric fireplace TV stand should just be named ‘Mr Versatility’. The 3 available finishes to suit any decor and the corner placement option makes this a winner. There were a lot of reviews from customers for this fireplace, as it is very popular, with good reason. 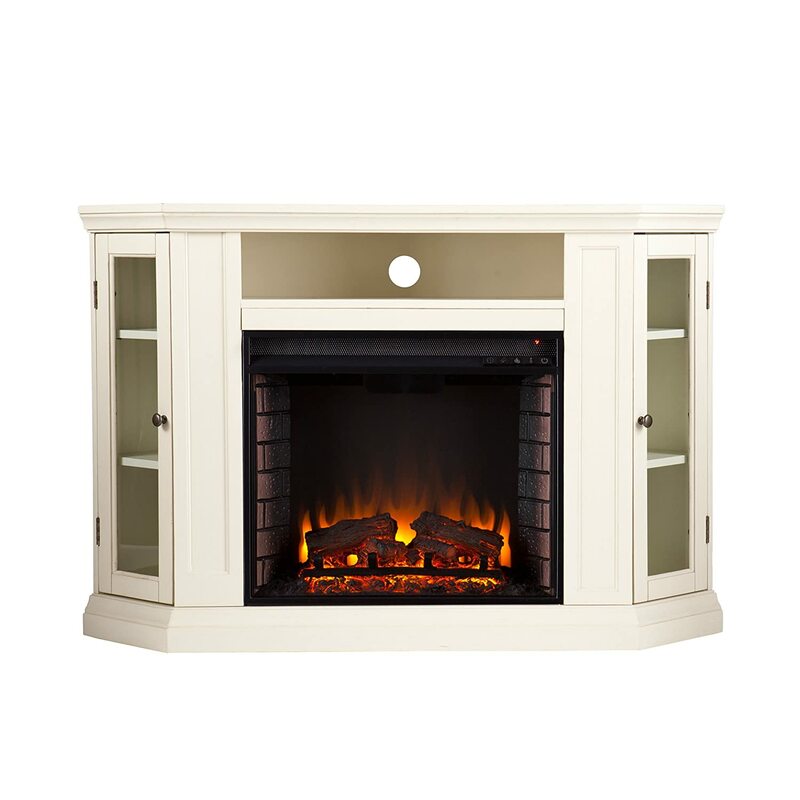 This SEI Sicilian Harvest Electric Fireplace review (Available in Ivory #FE9275 or Mahogany FA9277E finishes), will take a thorough look at the features and benefits that this free standing electric fireplace and mantel surround can offer you. At the end of the review there will be a series of pros and cons, which are summaries of comments made with actual buyer feedback. The overall aim of this review is to fully inform you so that you can make the right purchase decision. The Sicilian Harvest Electric fireplace has a traditional design that looks very elegant and it will add a touch of luxury to any room in your home or even your office. The fireplace will make your room feel really cozy, and provide a center piece that will be much admired and talked about. It can do double duty as an electric fireplace and a TV stand. 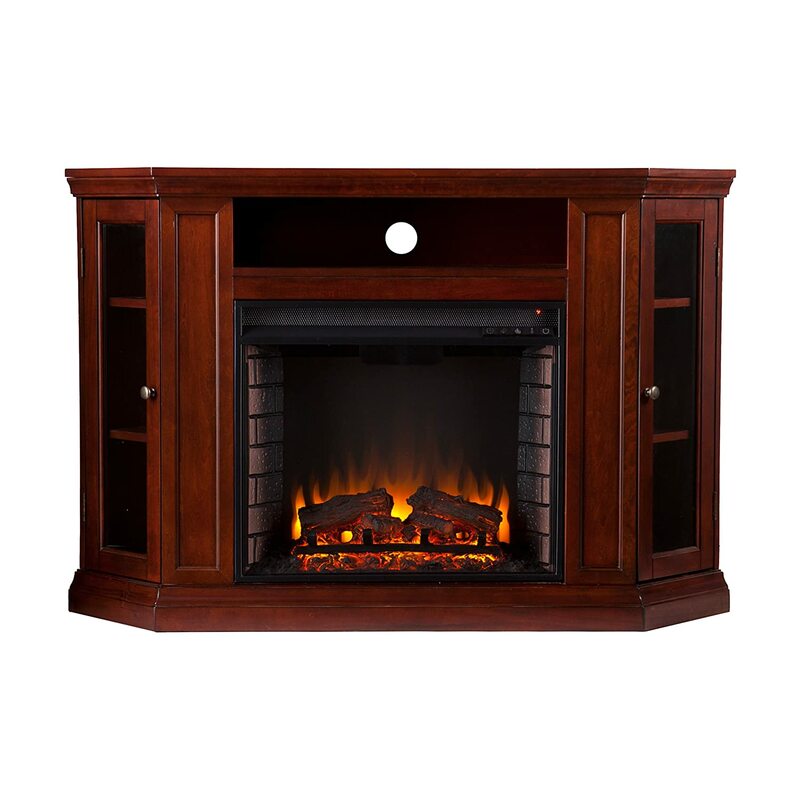 This free standing electric fireplace heater accommodates a flat panel TV up to 42.75″ W overall. The maximum weight load supported on top of the mantel is 85 lbs. The Sicilian Harvest Fireplace has very good fire and flame effects which consist of flickering flames that are adjustable and burning logs and embers which are also adjustable. There is no need for the heater to be switched on for the flame effects to work as they are independent. All of the fire and flame effects use long life LED’s which you will never need to replace. The faux burned logs and embers coupled with the flame effects certainly look realistic. There are five levels of flame effect intensity and burning log brightness. Dynamic embers effect pulsates dimmer to brighter for an authentic look. The flame effects do not make any sound when they are in operation. The glass at the front does not get hot which is a very good safety feature, especially if you have young children or pets or both. The heater with this fireplace is provided from a single ceramic electric heating element. Heat is forced out of the top of the fireplace. It is very quiet when the heater is in use, and the heater has been tested and will heat up a 1500 square feet room in only 24 minutes. There are no emissions with this fireplace or any pollutants to contend with. The heater is 100% energy efficient and the heater operating costs are low. The heater comes with an adjustable thermostat that is easy to control. The thermostat temperature range is from 62° to 82° and this can be increased or decreased in 4° intervals. There is also a thermal overload protector as an added safety feature. The heater has an output of 5000 BTU’s and 1500 watts. Alert – This fireplace apparently his an infrared heat model FEI9275- this review is on model FE9275 with standard heating. You will be able to control your fireplace by either using the manual controls which are situated at the top right of the fire box, or by using the infrared remote control that is supplied with the unit. The remote control is full-function. All fireplaces functions can be controlled remotely. There is an on / off button, thermostat setting control, timer button, flame intensity button, log glowing brightness button and a mood lighting button. There is an LCD display above the fireplace controls which will display the room temperature in either Fahrenheit or Celsius, as well as give you feedback on the buttons you have pressed with the remote control. The fireplace measures 44.75 inches wide by 14 inches deep and it is 40.25 inches high. The product weighs 99 pounds. The mantel of the fireplace can support up to 85 pounds and this is certainly strong enough to support a 47 inch TV. The unit will require assembly and full instructions are provided. A remote control (without batteries) and a user manual are also supplied. There were numerous comments about how good the fireplace looked. One person said that it looked really good in their living room and there were other complimentary comments such as “stunning”, “beautiful” and “wonderful”. There were also a number of customers who thought that the fireplace made their rooms look cozy. A lot of customers were very happy about the realism of the fire and flame effects. Some were skeptical at first as they thought that the fire may look cheesy and fake, but they were pleasantly surprised when they got the fireplace home. The quality of this fireplace was commented on a lot, and lots of customers remarked how they were impressed with the finish. It was described as sturdy by quite a few customers as well. Most of the customers were satisfied with the ease of assembly of this fireplace. There were remarks that the instructions for assembly were very clear and that it didn’t take much time to put it all together. There were a lot of positive comments about the heating function of the fireplace. A lot of people said that the heater made their room warm quickly even in the coldest of conditions. A couple of people were not impressed with the realism of the flame and fire effects. These were certainly in the minority and this is not considered to be a major issue. A handful of customers felt that it was very difficult to assemble the fireplace. One said that they had to pay someone else to do it and another said it would have been better if the fireplace had already been assembled. This is in contrast to the majority viewpoint. The DIY skills of individuals are always going to vary. Only one customer was negative about the heat output of the fireplace. Most customers were satisfied with the heat output so this is not considered to be a problem. Of the entire customer reviews submitted, 75% gave the fireplace a 5 out of 5 star review and 10% provided a 4 out of 5 star review. This is a very credible 85% in total, and it compares well to other electric fireplaces on the market. This is a good looking fireplace that will stand out and be a focal point in any room, and is likely to be positively commented on by visitors to your home. It provides a very nice ambience and the fire effects are realistic and the heat output good. This fireplace is a recommended purchase. Welcome to our comprehensive slim electric fireplace review, the Crawford by Real Flame. The model number is 8020E and is distributed by the Real Flame Company. This freestanding white electric fireplace caught our eye because it is a slim fireplace with a narrow profile. It uses a special firebox and design considerations that allow it to mount flush with the wall. Done so, it only protrudes 9.5 inches out from the wall. It does it take not take up much space sticking out in your room. Because of the depth of the flame effects set against a black firebox, it gives a nice 3-D effect and really appears to be built into the wall, adding an extra dimension in realism. Spoiler Alert: We really like this decorative fireplace for several reasons which will soon be revealed. We love the firebox and Ohhh…that remote. If you like the fashionable, clean look, this may be the one for you. NOTE: If you have arrived on our site and have decided to buy the slim electric fireplace then we recommend clicking through to Amazon.com and checking out this product and the daily discount. You will get very fast delivery (often free) and the great Amazon guarantee and service pledge. One of the best electric fireplaces we have reviewed. Bonus is it is free standing and creates instant focal point.